The hunt for Planet 9—a hypothetical, Neptune-sized object beyond Pluto—has stirred the scientific community since last year year, when a pair of Caltech astronomers argued in favor of the idea. Those intrepid scientists—Mike Brown, best known as the guy who killed Pluto, and Konstantin Batygin—are currently spearheading a search for this elusive giant. Recently, a network of citizen scientists have followed suit. The problem, of course, is we still haven’t found it. So what’s it going to take? Back in 2016, Brown and Batygin seemed pretty confident that we’d find the mysterious object sometime in the next few years. From the start, their assertion of a new planet was met with some skepticism, since astronomers (and a few quacks) had been peddling the idea of a “Planet X” for years. At a certain point, it kind of became the “fetch” of the solar system. Still, the researchers’ demonstration that a massive planet could be responsible for the unusual orbits of six known Kuiper Belt Objects motivated the scientific community to take Planet 9 claims more seriously. Over the past year, Brown and Batgyin have expanded their search team, and are currently gearing up for observations in the fall. According to Brown, the “wrong side of the sky” is up right now, meaning the part of the sky where Planet 9 might be is only visible in the daytime, which is rather inconvenient when you’re trying to make a breakthrough in planetary science. Another boon for the planet hunters is that their support network is huge. In a new project called Backyard World, a network of citizen scientists can look through troves of “flipbook” movies made from images captured by NASA’s Wide-field Infrared Survey Explorer (WISE) mission with the hopes of finding Planet 9, which astronomers say will look a little blue. Still, not everyone is confident that Planet 9 will be found any time soon—or at all. A new study from a team of scientists at Queen’s University in Belfast asserts that the discovery of a minor planet called 2013 SY99—which is, at its closest, 50 AU—might dash our hopes of ever discovering the world. After running computer models of the solar system, the researchers concluded that if Planet 9 did exist, it likely would have altered SY99's orbit so much we would not be able to view it. 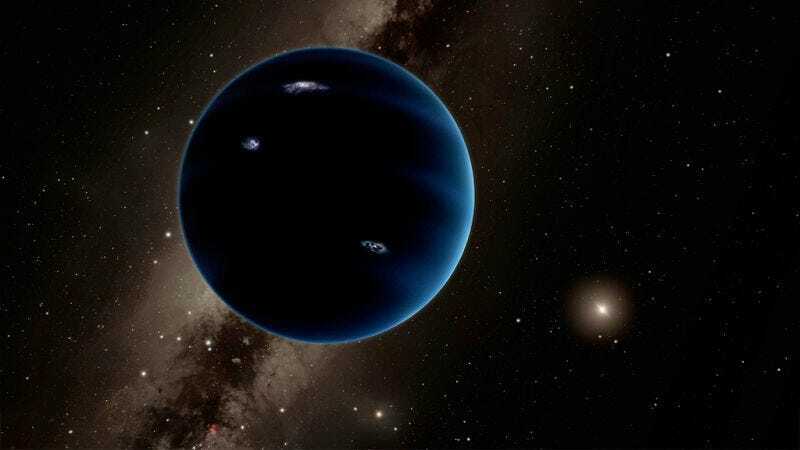 Bannister told Gizmodo that while her team’s findings don’t entirely disprove the idea of Planet 9, it calls the hypothetical world’s legitimacy into question. Brown, on the other hand, read Bannister’s paper and said he and Batgyin had predicted that astronomers would discover objects just like SY99. He said that finding these objects actually reinforces the idea that Planet 9 is out there. It’s so rare we get planetary drama as delicious as this one with Planet 9. But seriously, if this big guy is out there, it’s only a matter of time until someone finds him. Brown hopes it’ll be one of the citizen scientists.